Welcome fiddle campers 2016! You should have received an e-mail with this info. ​There is a lot of info below, but it is important to read it all to have the best experience at fiddle camp. If you purchased tickets with your registration for Sunday's "Instructor's Showcase Concert", then your names will be on a list at Fulford Hall and you can get in any time from 6:00 PM on. Dinner is available for purchase at the Hall between 6:00-7:00 as well-- the food is AMAZING, being provided by Haidee Hart (who will also be catering the camp again this year). You will get your name tag, snack tickets, and a smile at registration. You can register between 6-7 pm on Sunday night July 17 at Fulford Hall before the Instructor's showcase concert or you can register Monday morning between 8:30-9:30 at Stowel Lake Farm, 190 Reynolds Road-- remember to bring your cheque book or Canadian cash if you owe any money, thanks. If you are a FIRST TIME FIDDLER, or if you are trying out a new instrument this week, you need to make sure that you have an instrument! We have this great deal where you contact Larsen Music and they will take care of your rental needs and bring your rented instrument right to fiddle camp on Monday morning and pick it up after the concert on Friday! Call 1-877-472-1907 Fiddles are $20/week, cellos $45/week including insurance. All full time participants, even first time fiddlers, are a part of this dynamic class. It happens every day from 9:30-10:45 upstairs in the Barn. Monday is different, orchestra is in the afternoon so first timers know how to at least hold their instruments and are able to participate too. The tunes we learn from this class will be performed at the amazing Friday Gala Concert. or sign up on the first morning of camp, and help build your Fiddle community! There are officially no more class changes available at this time. If you ned to change a class you can try to do that at registration and with an offering of chocolate might have some success. If you registered for a delicious home cooked farm lunch each day then it will be waiting for you in the lower field between 12:00-12:30 daily. (You will be given a bracelet at registration which you will need to wear all week to get your lunches). If you didn't sign up for lunch please remember to bring your own lunch, as there aren't any stores/restaurants near by. Sorry, It's too late to sign up for lunches at this point. You get snack tickets if you are a participant. If you want more snacks you can buy tickets at the store and use them at the snack shack, or pay cash. We will be providing healthy snacks and fresh baked cookies, squares, muffins, and juices plus organic Salt Spring coffee and organic tea and yes of course there will be fruitsicles. Please bring your own mug for hot beverages (or purchase a fiddleworks to-go tumbler)-- there will be no disposable cups provided. Also bring a water bottle to stay hydrated! All water onsite is excellent for drinking. We will be handing out t-shirts on Monday afternoon to those who pre-ordered with their registration. If you need to trade for a different size you can do this Tuesday morning. Tuesday afternoon at 3:15 any few remaining shirts will go on sale. Our Gala Concert will be at Centennial Park in Ganges, as long as the weather cooperates. The concert will take place on Friday July 22nd starting at 7:00 sharp under the band shell (tune up at 6:15), and what a concert it will be! Please bring blankets or festival style low-to-the-ground seating so you can sit on the grassy hill and enjoy the show. After the concert we will have our community dance. Because this beautiful location is right on the ocean, it can get pretty cool at night-- so remember to bring extra layers so you'll stay warm and have maximum fun!! Please do invite all your friends and family to the show. Wednesday: Possibly capture the Flag and definitely Jamming in the barn from 7:30-? This is a tradition started by Oliver Schroer, and which we love to continue each year at camp in his memory... basically, it is a colourful spontaneous music parade through downtown Ganges leaving from the boardwalk just behind Treehouse Cafe on Wednesday night at 5:45 PM. Bring your crazy wigs, colourful clothing, and join in the joy! Come get your merch! On site we will have a store with Instructor's CD's, Music Books, shirts etc and an information station where you can get info about camp and the island, and sign up for Thursday's variety show. Store hours are approximately 8:45-9:30 am and 12:00-2:00 pm Tues-Friday. Lovely Laura the luthier (and little Charlotte and Quinn!) will be on site to fix instruments, rehair bows, and answer your questions about anything to do with fiddles. They will also have fiddles, bows, cases, strings and other assorted music items for sale. We are very sad to tell you that Calvin Cairns has had to withdraw from teaching at camp this summer. Because of this we have had to do some last minute shuffling of instructors: Merrie Klazek will now teach the First Time Fiddle Class, Zavallennahh will teach Intermediate Fiddlin’ Around the World and Beginner + Fiddle Favourites, and master fiddler Pierre Schryer will teach Merrie’s Beginner Fiddle Class and Calvin’s Int+ Jam Band class. Thanks for your understanding. Attached to your e-mail and below is a document called "What To Do on Salt Spring Island" with a list of things to do and places to eat, get groceries, driving directions etc. 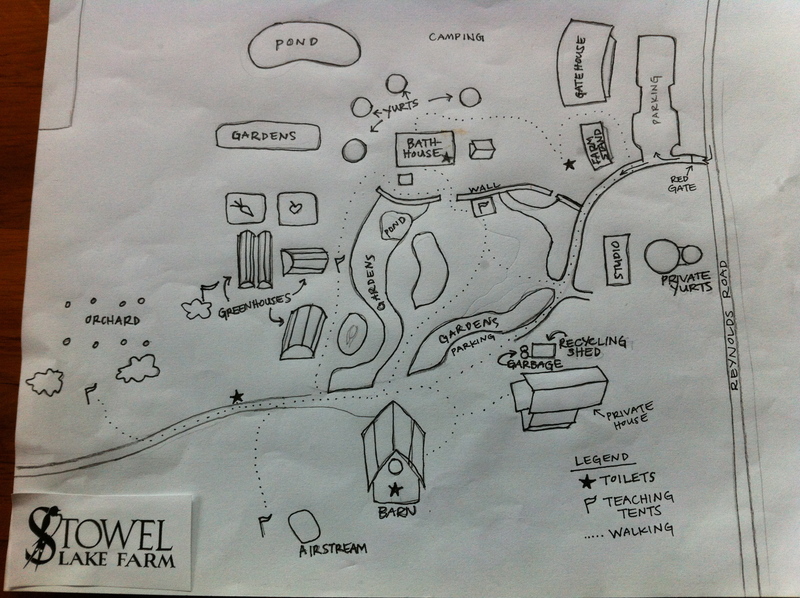 Also attached are schedules of the week, a daily schedule, and a map of the Farm. ​Stowel Lake farm offers tent and RV camping in a beautiful outdoor setting with access to clean hot showers, flush & port-a-potty toilets, an outdoor cooking, cooler storage and dish washing area, electricity, and on site wi-fi. Also, all water on the farm is good for drinking. You are welcome to come and set up your campsite anytime from 2:00 onwards on Sunday July 17th. Stowel Lake Farm is located at 190 Reynolds Road, off of Beaver Point Road on the south end of Salt Spring Island... it will be well signed. When you pull up to the gate, be patient and enjoy the excitement of your arrival and beautiful scenery as it opens for you. Forte camping is in the meadow just beyond the Gatehouse (which is the first building on your right when you arrive) and "pianissimo" quiet camping is in the back meadow beyond the greenhouses. The spots are all first come, first serve. Please check off your name / sign in on the sheet posted near the front entrance of the Gatehouse. Karin BJ and Owen Newson, our onsite camping managers, will be available to answer any questions you may have. Besides your tent and linens, you need to bring your own cook stove & dishes etc if you plan on cooking. Your dishes & cookware, and all your food must be kept in sealed plastic totes or coolers in an effort to not entice rodents. You are allowed to keep totes and coolers on & under tables in the camp cooking area. They must be labelled with your family name. Please note: the walk-in-cooler is not available to campers this year. However, you will be able to pre-purchase daily ice delivery on site, and campers are allowed to freeze their ice packs in the freezer located in the small room directly ahead when entering the barn by the lower door. Again, be sure your ice packs are labelled too. The upstairs of the barn is a welcome space for acoustic night jamming and conversation in the evening (no curfew). When you arrive (starting 2:00 pm onward on July 17) the name of your party will be posted on the door of your room/yurt; if you are unable to locate where you are staying or have concerns, please talk to Karin B.J. who is camping on site and is also the store manager. *There is limited space in the kitchen fridge... You may want to bring a cooler (please label!) for your perishable items; there will be ice available for pre-purchase daily, and smaller items may fit in the kitchen fridge. Please label all items in the fridge or they may disappear, especially if they look yummy! Other food & kitchen gear can be neatly stored just outside the kitchen under the covered porch area in a sealed cooler or tote i.e.. rubbermaid which is clearly labeled with your name on the lid & side. *Please bring your own dishes & cookware, and please clean up after yourself. A couple of people who are booked for 5 nights have asked about adding a 6th night to their stay; you are welcome to do this, please just e-mail us and bring cash or cheque to camp on the first day to make your additional payment.